That’s Richard Nigro, the chef at Richard’s Hintonburg Kitchen and the visual artist who stopped exhibiting for 15 years but came back, full force, with an exhibition last June at Wallack’s. Now, three of those photo-based works from Wallack’s have thankfully appeared at the annual exhibition at Ottawa City Hall of art acquisitions by the city in the past year. The city bought them so, one expects, we will all be able to see them for many years to come in a public building, perhaps when paying a parking fine, meeting with your local councillor, maybe even at the city-run VD clinic. 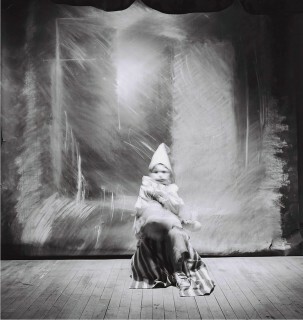 Two of Nigro’s works are in a hallway outside City Hall gallery, beckoning visitors inside where his most spectacular work, a one metre by one metre image of a devilish and ghostly child-clown holds court. Nigro’s three images — they all look like they emerged from some Victorian-era séance — are part of the city’s new 206 artworks from 63 artists. Those figures include 126 donated photographs from David Barbour, who gets his own show later this fall. This means there are about 80 artworks acquired for about $100,000, which works out to about $1,250 on average for the purchases. That’s a steal when you realize that some of the city’s top artists, whose normal prices far exceed $1,250, are represented in the City Hall show, which continues until Sept. 29. — Another one of Geneviève Thauvette’s Dionne Quintuplet photo-based series, this one called Melons, showing five identical young women (all of them Thauvette) lined up to consume watermelons. — Three photographs in Marie-Jeanne Musiol’s Black Hole series of images of what appears to be black holes in space but are in reality extreme close-ups of latrine holes at the Auschwitz-Birkenau concentration camp. The resulting images are unbearably sad. 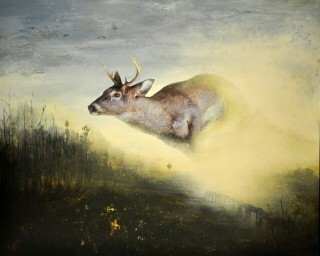 — A mixed media work from Marc Nerbonne called Sparkling Deer from his creepy but hauntingly beautiful road-kill series. 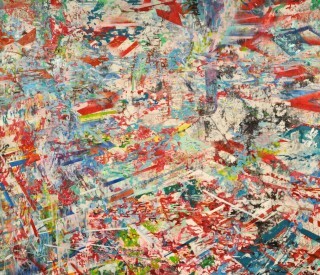 — Amy Schissel’s Streamline 1 is another of her trademark abstract paintings of the digital world in which we are all forced to live. 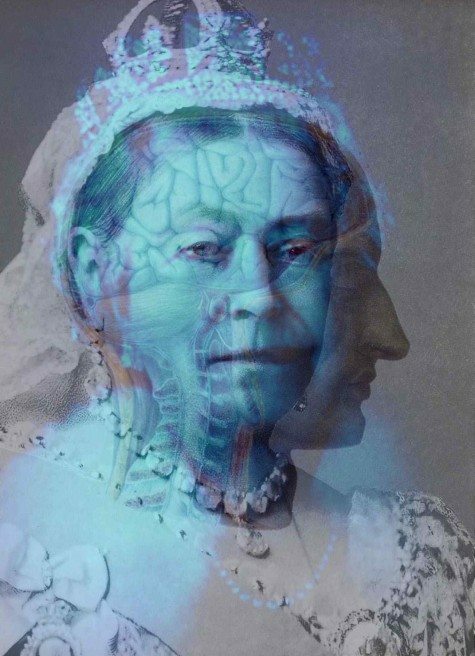 — Cindy Stelmackowich is represented by Victoria, a photographic image of the old Queen superimposed upon a medical diagram of a man’s brain. It is difficult to describe this image and not make it sound gross. It is actually quite beautiful, romantic even.